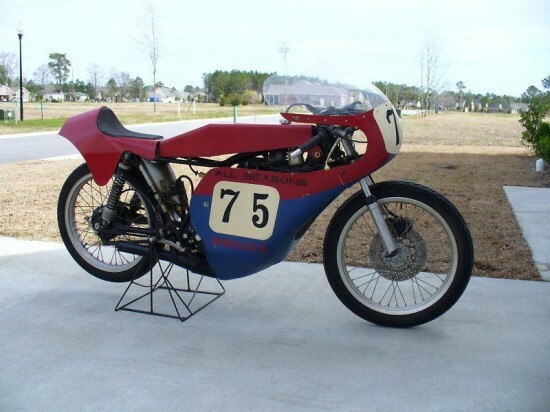 What is more “classic sport bike” than a vintage road racer credited with starting the careers of numerous racing legends? 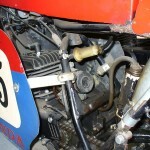 Essentially an “over the counter” racebike that was sold to the public, the MTR 125 featured an engine borrowed from the 125 Elsinore dirt bike, and many other bits taken from existing Honda parts bins. The result was a surprisingly capable racer, pushing 26 horsepower and six-speeds and creating a close, competitive class. These bikes are also surprisingly popular – see this one on RSBFS, and this one as written up by fellow contributor Brian right here on CSBFS. With a tiny engine, tiny cockpit and tiny clip-ons, these are not for the large of scale individual. Still, it is more fun riding a slow bike fast than a fast bike slow, and maximixing the potential of the little MTR taught many riders the key components of maintaining momentum and making smooth, controlled movements. This is the second time this has been listed and found out a few things about this bike from a keen eyed ebayer. There is a lot of aftermarket high dollar upgrades on this. 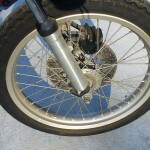 The pipe, gas tank, brake rotors ect. 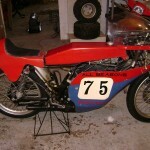 This is a 1975 Honda Elsinore 125cc factory road racer. This is as Rare as they come, this is in excellent condition. It has matching engine and frame #’s. Here is a little history of what i know about it. 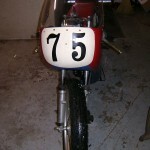 I talked to the original owner (dealer) who had the bike in the 70’s, he wasnt sure if it was in 1974 or 75. But he had a couple of them and he couldnt remember if it was sold or a bike he sponsered. But being that his shop’s name was on the fairing he would tend to think it was a sponsered rider. I bought it off of a person who had bought it out of a garage in west virginia 27yrs ago. He never rode it only started it. He kept it in a climate controlled warehouse on a shelf where it was still sitting when i bought it. This thing is almost like new, there are no major dents or scratches on the tank. The fairing is all intack without any breaks or cracks that i can see. The rear tail seat section is not original and has been changed and is scratched. 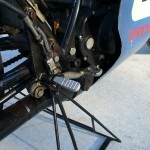 The shifter is stock but the toe piece has been broke off and replaced with a bolt. The pipe looks near perfect with no flat spots or major dents. The gas tank is aluminium and near perfect. The frame is nice and straight, the forks have no rust or pitting. I can not find one piece of rust anywhere on this bike. I have not started this but I have got it to spark and it seems like it has good compression. i believe this is a 6 speed and it seems to shift thru all the gears fine. They added a tach but it is broke off and was told it got broke when the person i bought it off of was loading it 27yrs ago by turning the handle bars to far. The rims are perfect with no dents, cracks or rust. This is absolutely beautiful and would make a great addition to a collection or in a musem or as a vintage ahrma racer. This comes with 2 extra cylinders, 1 ported and polished and 1 stock. Unlike many of the beautifully restored MTRs we have seen, this one is a racer and a survivor. Sure, there are some scuffs, scratches and damage on the panels, but there is also the knowledge that this bike has run in anger on racetracks across the country. 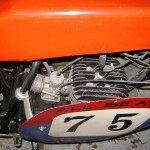 There are also some spares – some modified and some stock – that are usually not included with a perfectly restored bike. For me, I’ll take the authentic racer any day of the week! There are a few discrepencies with this particular ad. 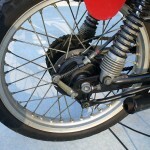 The listing shows the bike both as a 1974 AND a 1975, however the MTR was not officially introduced until 1976. 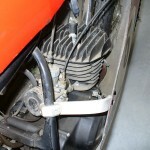 It could be that the engine dates the bike back to that age (the Elsinore motor was introduced in 1973), but the factory roadracers were not made available until 1976. Be that as it may, this is still a relatively rare, and undeniably cool piece of motorcycling history. The best part is that you can actually ride it in vintage events!
. 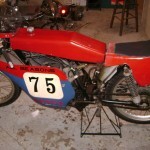 These are great little bikes from a time you could purchase a real race bike at your local Honda dealer. Enjoy, and tell ’em you saw it on CSBFS! 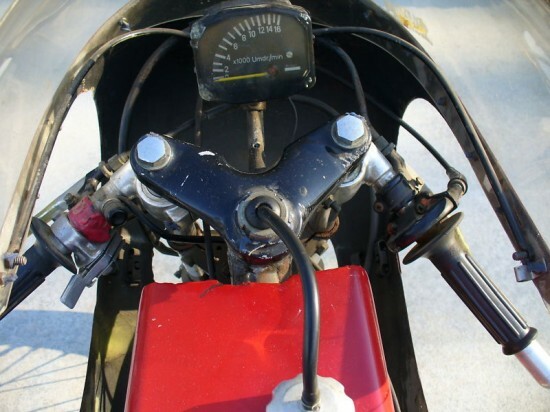 Next story The Real Deal: 1975 Yamaha TZ750 Not for sale.